Mountain to Sound Outfitters is a Northwest Snow Sport & Paddle Sport Outfitter. 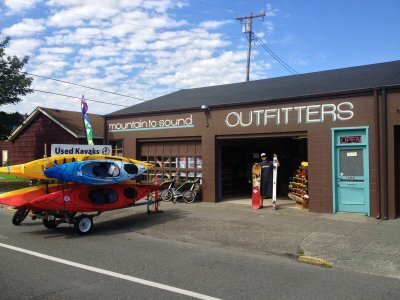 Mountain to Sound Outfitters has been providing the Seattle, WA, area with a wide range of kayaks, stand up paddleboards, skis, snowboards, clothing, and accessories, since 2009. We also offer qualified repair services, performed by certified technicians, to keep your sporting equipment in peak condition so you can enjoy your favorite outdoor activities in safety and comfort. Locally owned and operated, our business philosophy is based on a strong foundation of community spirit and customer service. We're passionate about expanding the outdoor culture and helping people enjoy all that the Northwest has to offer, from Mountain to Sound. Our staff members provide residents and visitors with expert knowledge of sea kayaking, stand up paddle boarding, skiing, and snowboarding. They're a friendly bunch of folks dedicated to making sure customers have the proper equipment and gear to suit their individual needs and prepare them for adventure on the slopes or the water (to learn more about our staff, visit our team page). Please don't hesitate to contact us with any questions you may have regarding our products and services. We look forward to providing you with the industry's finest selection of ski and SUP gear, as well as the kind of personalized assistance and ongoing support that will ensure an unforgettable outdoor experience!